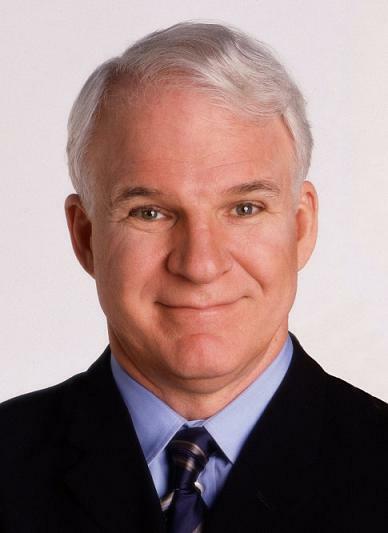 Steve Martin is an American comedian and musician, who first became famous as a writer for The Smothers Brothers Comedy Hour and as a frequent guest on The Tonight Show. After appearing on Saturday Night Live as a guest host, he quickly became (and still is) one of the most popular comedians in the United States. Since the 1980's, he has focused more on acting than stand-up comedy. Martin is also well known as an accomplished banjo player and would often play the instrument during stand-up comedy shows in the 1970's. He has released two albums of bluegrass music: 2009's The Crow: New Songs for the 5 String Banjo (for which he won a Grammy for Best Bluegrass Album) and 2011's Rare Bird Alert. He has recently returned to touring, but instead of stand-up comedy, it's with the bluegrass band The Steep Canyon Rangers. He was never a cast member of SNL (a common misconception) - he was a cast member on Lorne Michaels' failed ABC prime-time sketch series The New Show, but was only a frequent host on SNL - but Martin still became very close with several of the cast members, including Gilda Radner. On the day Radner died from ovarian cancer in 1989, Martin was to host SNL; after introducing a video clip of him and Radner appearing in a 1978 sketch, he became overcome with grief and started to cry. Steve Martin is a surprisingly deep guy; he has a degree in philosophy. He has done a significant amount of writing, not only penning screenplays for some of his best movies (LA Story, Roxanne, Bowfinger) but also stage plays (Picasso at the Lapin Agile) and novellas (Shop Girl, The Pleasure of My Company.) He is also the owner of one of southern California's finest private collections of modern art - and it has been implied by many, including Martin, that expanding his collection is the motivation behind his taking such roles as Bringing Down the House and The Pink Panther. Martin has guest-hosted Saturday Night Live 15 times, as of his January 2009 hosting (musical guest: Jason Mraz), breaking his previous record of 14 on a season 31 episode (with musical guest Prince; an episode that originally was supposed to be the first episde of season 30, but both host and musical guest declined and the 30th season premiere was headlined by Ben Affleck with musical guest, Nelly). As of September 2011, Alec Baldwin has now broken Steve Martin for most frequent host of SNL (a record Martin has held since 1989, when he beat Buck Henry's record of ten) with 16 episodes under his belt. Funny Foreigner: He and Dan Aykroyd played Georg and Yortuk Festrunk, Czech immigrants and swinging bachelors, in a series of early SNL sketches. Steve also carried over the voice to his stand-up. Just Like Making Love: "Hosting the Oscars is much like making love to a woman. It's something I only get to do when Billy Crystal is out of town." Name's the Same: No, he wasn't the lead singer of the Baroque Pop band The Left Banke back in The Sixties, even though he is an accomplished musician. Nor is he the lead character in 1956's Godzilla, King of the Monsters. Why Do You Hate the Dog? - Martin often plays the MAWM in these types of comedies. When You Coming Home, Dad? - When he plays fathers, this is generally part of the character's dilemmas. This page was last edited on 9 January 2019, at 20:27.